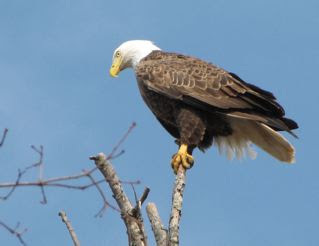 The most exciting thing that happened since my last newsletter is a visit from a Bald Eagle. To make it all the more exciting, it was on my first official bird counting day, February 18th. And it was the last seven minutes of the one-hour session I had scheduled. I had 18 on my list and could now add two raptors. The crows didn't like the idea of the eagle so they tried to scare him away, but after only a few minutes, the Red-shouldered Hawk also joined the unwelcoming brigade, flying in with screams that were easily understood to mean, "it's time for you to go!" You can view videos of the eagle, with a real short one of it leaving and flying right over my head. WOW! It's like it was all set-up just for my Great Backyard Bird Count day! That's definitely one of my 60 adventures for my 60th year. 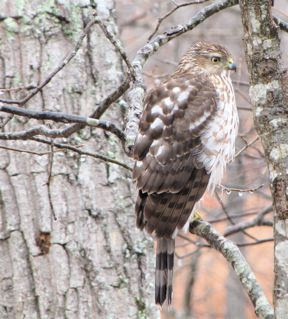 The juvenile Cooper's Hawk has continued to hang around. I guess that's the down side to creating a great bird habitat. You get so many birds, the bird-eaters decide to benefit also. I've been blessed not to see the hawk take any of our birds, but I do see him often enough at various locations in our yard. View video of the hawk. It's such a beautiful bird and I know they are hungry also, but I long for the days when the wolf will dwell with the lamb. I will be there to lie between them. It's finally March and that's the month that holds the official day that Spring begins. I am so ready! Yesterday, my friend, Ginny, in Canada emailed and said they just got 8 inches more of snow on top of 18 inches that was already packed down. Oh my! Yesterday in the beginning of the day I was outside enjoying the warm weather. It didn't last long since clouds and rain came in and that made it dreary, but I was so grateful there wasn't 26 inches of snow out my windows. My friend finished her email with this line, "Spring can't be too far away, can it?" Isn't the internet great! I can respond to tell her that Spring is definitely headed north. We don't have it yet either, but I can give hope it gets better! Sometimes we all need a ray of hope shined into our lives by a friend, into an area that has looked so dark for so long that you wonder if life will ever be good again. Our Friend, Jesus, shines His Light into our hearts and spirits and tells us that life is good. Pain is bad, but in Him we can have peace and joy and wholeness as we rest in His loving arms and allow Him to heal us as He directs our path to wholeness. Don't give up hope. March is also the time when we go back into Daylight Savings Time. I love later sunsets. Seems there's a lot of controversy out there on this event. Some people seem very angered by it. I don't make the choice to worry over such things. In my younger years I think I had the impression I could control the world if I was simply upset enough about an issue. Somewhere I figured it wasn't worth the investment. One warm February day, I decided to get some of the leaves off the top area of the pond. I love seeing what comes out since I thoroughly dig through the stuff to return all bug and dragonfly larvae, newts, bugs, tadpoles, etc. There's a lot of balance in a good pond and we want to keep it, even though our pond is only 4' x 8'. It's a key ingredient in our habitat since I love these newts that spend a good part of their lives in ponds in the lower layers of leaves. By the way, the red spots are on its back and not as easily seen. 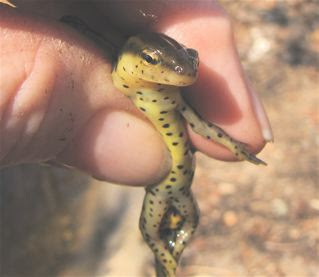 They are born in the water and crawl out after metamorphosis to continue development as a terrestrial creature. When mature it will again return to the pond. 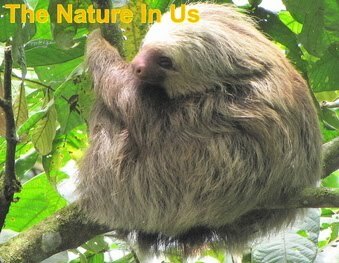 I was blessed to see one of the brightly colored juveniles when I raised a stump one day. For those who garden, I hope you're getting your dreams laid out. 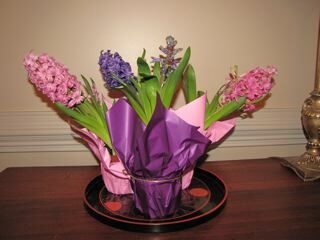 My favorite Springtime bulb (that I can grow here) is purple hyacinth. The deer don't eat them! The smell is delicious! My friend, Dianne, in Mobile, AL, has already put in a lot of her veggie garden. It's the most exciting time of the year for her. She loves seeing seeds sprout. Last year I was down visiting with her as tiny little shoots came up under grow lamps in her utility room. You could see the excitement of a three-year-old with a new doll in her entire face. It was an ultimate joy for her and being able to enjoy it with her added to each of our experiences. What are friends for? It seems sad that so many of the people we love most don't live nearby. I guess that makes eternity look really good ... and it gives us the urgency about getting our loved ones into the Kingdom while there is still time ... before the Bridegroom calls. Watch for those warm March days and plan to get out and enjoy them! Look closely all around you because the "critters" are all getting out and about too!